Since 1921 Remington has been providing consumers with quality outdoor power equipment that stands the test of time. It’s top rated on the market, is cost effective and most importantly, reliable. Founder Arthur Mall started out building gas powered and electric powered drills and saws in Wisconsin. Known to be reliable products, it wasn’t long before business boomed and the Remington company was founded. The first Remington chainsaw was produced in 1954. Remington now produce chainsaws, pole saws, gas trimmers, cultivators and blowers for professionals and homeowners all around the world. Remington produce eight different models, all manufactured under the name of Remington. Two are electric powered and six are gas powered. The interesting thing to note about Remington chainsaws is they are all named with product titles that are easy to remember. They have a model number followed by a name such as “Rebel”, “The Outlaw”, and “Rodeo”. This makes them easy to remember when ordering parts, as well as being edgy on the market. In comparison to some other manufacturers, brands and models, they are also exceptionally hardy and reliable. They are also suited to a range of people with saws for professionals, commercial grade saws for arborists, and electric powered saws for homeowners. It starts well every time. The chain stays well lubricated. It cuts large trees with ease – it has a powerful engine. The chain doesn’t stay sharp for long. It can overheat easily on large cutting jobs. Dimensions: 20 x 12.2 x 12.5 inches. QWhat is the oil to gas ratio? A40:1 – 3.2 ounces to 1 gallon of gas. QDoes it come with a case? Yes, a heavy duty case. AYes, a heavy duty case. QWhat is the CC rating? If reliability is what you’re after, this 51cc Remington chainsaw is the answer. Not only is it powerful enough to take on large jobs, but it also starts very easily with its QuickStart technology. It requires minimal maintenance as well, and users online state that it’s hardy, durable and very rarely breaks down. Overall, this petrol powered saw is a dynamo and is easily the best Remington chainsaw for the money. Check out what other people who purchased this product think about it. Read Remington RM5118R Rodeo gas chainsaw reviews. It’s perfect for the homeowner in size and performance. It’s very affordable and well priced on the market. It has a powerful 42cc engine. It comes with a lot of extras which other brands may sell on top of the purchase cost. In comparison to models of similar specs, it’s very heavy. It leaks chain oil so it pays to drain it before storing it. The carry case isn’t very heavy duty. Dimensions: 19.2 x 12.4 x 12.5 inches. QDoes it come with bar and chain oil? This Remington chainsaw has received glowing reviews online for its reliability and ability to suit a range of homeowners. It has a powerful 42cc engine, low kickback chain and can easily handle trimming and pruning around the home. It has a sturdy chassis as well, with pro-grade parts that stand the test of time. If you were in the market for a chainsaw that wouldn’t break down on you, this one would be it. You can also receive the best deal on Amazon with the saw, chain oil, the bar and chain and a carry case all for a highly competitive price. Overall, this is one of the best Remington chainsaws for the money. Check out what other people who purchased this product think about it. Read Remington RM4216 Rebel gas chainsaw reviews. The 12 amp motor is powerful in comparison to other electric chainsaws. It has a comfortable handle which allows you to use it in different trimming positions. It’s targeted towards the large homeowner market. It’s quite heavy for its size. The chain can fall off frequently. Dimensions: 8.8 x 9.8 x 32.8 inches. QDo you use bar and chain oil on this chainsaw? ANo, use SAE #30 motor oil. AIt was assembled in Mexico. QDoes it come fully assembled or does it need built? 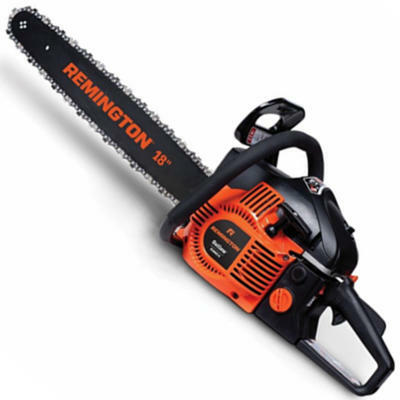 This Remington 16 inch electric powered chainsaw is very underrated on the market. It’s affordable, costs very little to run and maintenance is almost non-existent. 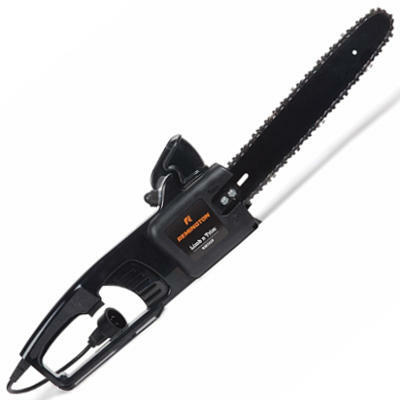 It’s also very powerful in comparison to other brands of electric chainsaws of similar specs. It can cut in relatively hard domestic environments, and does so with ease. It’s also reliable, and parts are priced well on the market. It does everything it should, and does so reliably and comfortably. Check out what other people who purchased this product think about it. Read Remington RM1645 Versa corded electric chainsaw reviews. It starts easily with QuickStart technology. For the cost, it’s a very powerful saw. It comes with extra accessories as part of the price – most other manufacturers don’t offer this deal. It’s balanced and comfortable for easy use. The chain tensioner isn’t well built. It can overheat when used for a long period of time. Dimensions: 34 x 12 x 12 inches. QDoes it need assembly on arrival? Not all premium, quality and hardworking chainsaws have to cost a lot of money. 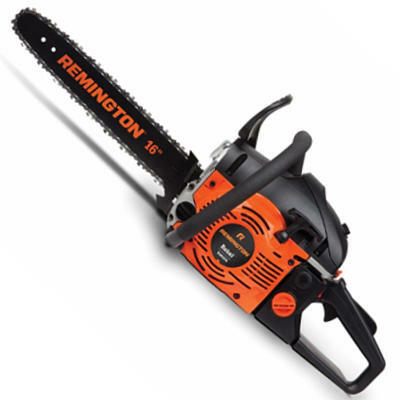 This Remington 18 inch gas powered chainsaw is proof of that. It’s exceptionally powerful, offers easy starting with its QuickStart technology, and it just keeps going! Reliability is to the fore, and you get the best deal with all the additional extras that come as standard. This saw really is one of the best Remington chainsaws for the money. Check out what other people who purchased this product think about it. 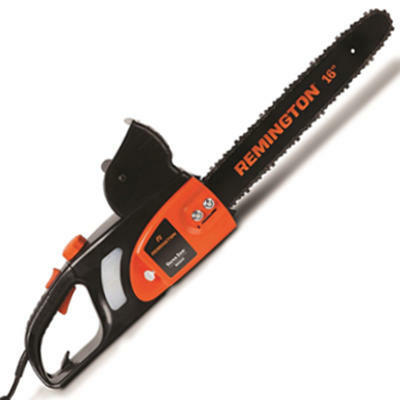 Read Remington RM4618 Outlaw gas chainsaw reviews. It has an exceptional 10-15 feet reach. It can be used both as a pole saw, and as a standard handheld saw. In comparison to other brands of pole saw, it has a longer 10 inch chain whereas most others have an 8 inch chain. It has some plastic parts which don’t withstand the pressures of rigorous use. The chain needs oiled frequently. It’s quite heavy which can make it difficult to use far above your head. Remington electric powered pole chainsaw. Dimensions: 66.75 x 9 x 9.5 inches. QCan it be removed from the pole and used as a standard saw? ANo. It doesn’t have an angled head. This Remington pole saw has been extremely well received in online reviews by those who have chosen to purchase it, It’s powerful, cuts well, and can even tackle limbs 15 feet above the operator’s head. It’s also very reliable and can be purchased at a very competitive price on the market. You truly get the best deal when you buy this pole saw. It also has a powerful 8 amp motor, as well as operating as a standalone saw without the pole. Check out what other people who purchased this product think about it. 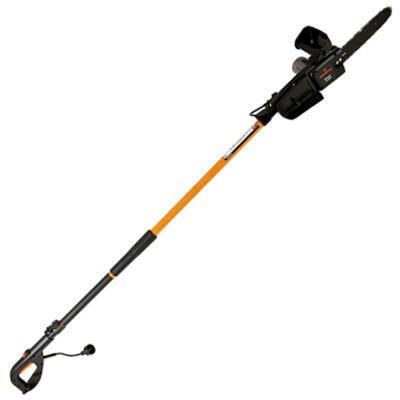 Read Remington RM1025P Ranger electric pole chainsaw reviews. It can be detached from the pole to be used as a standard saw. It has a 10-15 foot reach. It has a powerful 8 amp electric motor. It leaks bar and chain oil so it must be drained before storing. It’s limited in where it can be used by its cord. It’s quite heavy which makes it hard to use above your head. Dimensions: 9.25 x 8.44 x 39.75 inches. QCan it be detached from the pole? AYes, to be used as a standard saw. ANo, you must push the bulb to release oil for each big cut. AApproximately 50 foot with 14 gauge for heavy use. Aside from the known issue of leaking oil when storing, this saw is one of the best Remington pole chainsaws for the money. It gets into those hard-to-reach places, it has exceptional power, and it has a 10 inch bar and chain when normally they are 6-8 inches. It’s also easy to use and is cost effective to purchase both the unit and spare parts. For those looking to get light home maintenance completed in high places, this is the saw for you. Check out what other people who purchased this product think about it. 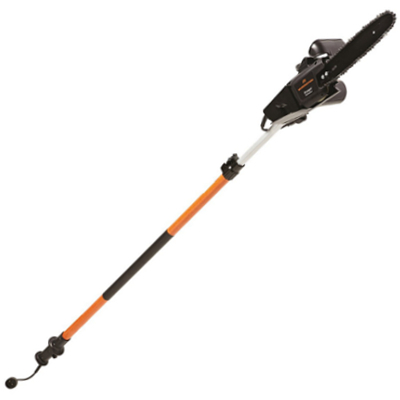 Read Remington RM1025SPS Ranger electric pole chainsaw reviews. It requires minimal maintenance as it’s electric. For its size, it has a large 14 inch bar and chain. It has a limited market, only being suitable for light home use. It can’t be taken far from a power source. Dimensions: 14 x 7 x 8 inches. QWhat chain oil does it use? ASAE #30 motor oil is recommended. QWhat is its working voltage? Homeowners will be happy to know there’s a chainsaw on the market for sale, suited to that light home maintenance undertaken from time to time. There’s no need to purchase a heavy duty saw when you’ve got access to a lightweight electric saw that requires minimal maintenance. This saw is quite powerful for its size, and will be perfect for those light trimmings needed completed around the home. It’s easy to maintain and store, and it’s also very reliable when taken care of. Overall, this chainsaw is one of the best Remington chainsaws for the money. Check out what other people who purchased this product think about it. Read Remington RM1425 corded electric chainsaw reviews. MTD Products, under the Remington brand. Where are Remington chainsaws made? They are assembled in Mexico by parts manufactured in China. Where do you buy Remington chainsaws? 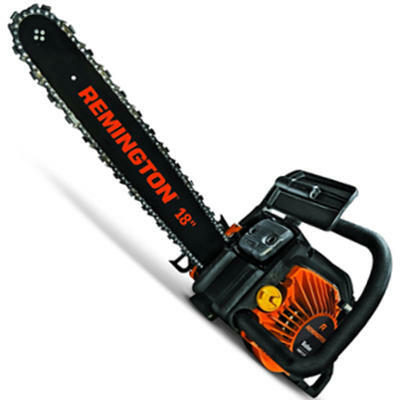 Remington chainsaws can be purchased online on websites such as Amazon, as well as in Home Depot and other leading hardware and retail stores around the world.